Confession time! Unburden your musical souls! What "unhip," "uncool" music are you embarrassed to admit liking, but can't help liking? 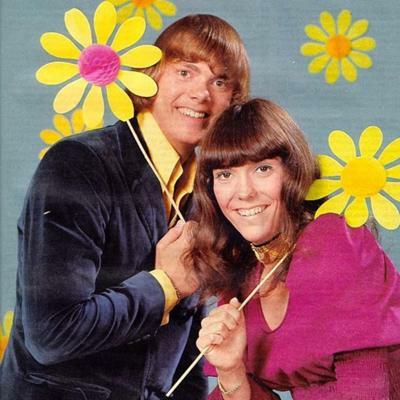 I admit I have a weakness for the music of the Carpenters, the siblings who, during the 1970s, recorded the most whitebread pop ever committed to record. I'm not embarrassed by any music I like. But I guess Broadway show tunes would fit here. I'm gonna need some time to reflect on this one. They're so unhip that they're hip. As one of the greatest philosophers of our time once said, "It's hip to be square." I still listen to this in the shower. I usually try not to be judgmental, but listening and not signing along in the shower is so many flavors of wrong. Petula is the greatest musical artist of all time. I have a soft spot for Backstreet Boys and NSYNC. I also regret nothing! Disco was my bread and butter back in the day! And these boys helped lead the charge! The Carpenters remind me of weekend visits to the Lake District with my Dad and his 2nd wife when I was a lot younger. They were often on in the car and I've had a soft spot for them ever since. I wouldn't say that I'm ashamed to enjoy the odd piece of music that's outside of my usual orbit. Fun take of the song.